Maximun strength & durability - high grade chrome molybdenum steel body & jaws Reliability - straig.. These Irwin Vise-Grip WRC Curved Jaw Locking Pliers are ideal for a variety of applications and mate..
Straight Jaw Locking Pliers. Capacity 29mm. Hardened teeth are designed to grip from any angle. I..
Irwin Capacity - 455mm Adjusts quickly for ratchet action in either direction. 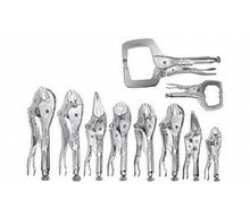 Chain holds and lo..
Straight Jaw Locking Pliers. Capacity 41mm. Hardened teeth are designed to grip from any angle. I..
Straight jaw provides maximum contact on flat, square or hex materials Capacity - 41mm Unique cu.. Vise Grip Long Nose 100mm/4"
Vise Grip Long Nose 150mm/6"
Long, straight nose provides easy access in narrow, hard to reach places Capacity - 57mm Unique ..
Long, straight nose provides easy access in narrow, hard to reach places Capacity - 73mm Unique .. Vise Grip Long Nose 225mm/9"